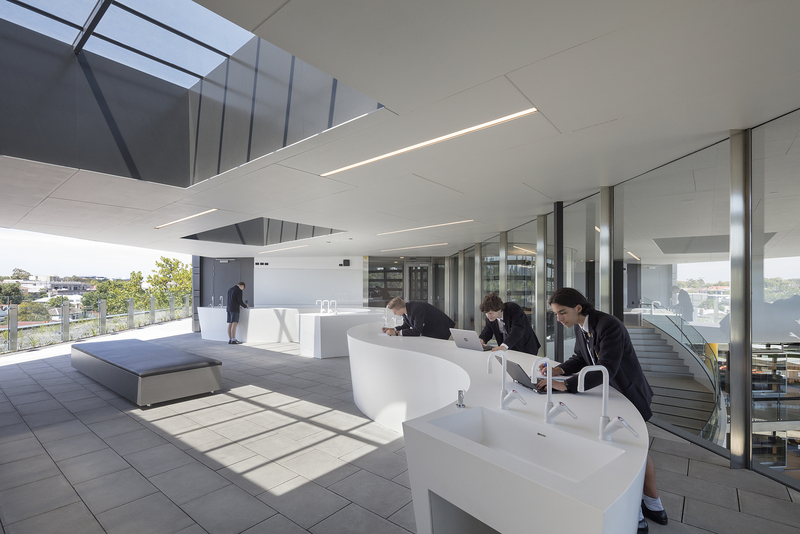 Architects Denton Corker Marshall have designed the first truly integrated BiPV project in Australia at the prestigious Melbourne Grammar School in Victoria. Although this is the 5th installation delivered by ETS, DCM opted to use the unique material as part of the building fabric as opposed to a free-standing structure or cladding material. The 1kW system utilizes the opportunity to generate energy from glass – a material that would typically have been used for the skylights regardless. The Amorphous Silicon cell used within the laminated glass has the ability to reject up to 95% IR and 99% UV in addition to allowing the passage of natural light via the 20% transparency option. Energy produced from the PV glass is displayed via the inverter Wifi capability and is relayed to a local PC or tablet for the students to learn about the varying effects of weather on solar energy production. ETS oversaw the complete turnkey installation for Kane Constructions including Architectural specification, costing, procurement, installation, and commissioning of electrical components. The project sees our fourth Melbourne project with this customizable PV glass product with further projects already specified for installation in 2018/2019 including three residential buildings highlighting the ability for BiPV to solve a variety of planning and technical issues. The MGS project was part-funded by SLIC – an internal student group that raises crucial funds towards sustainable works at the campus which ensured the installation of the solar skylights went ahead.